I hope all of you had a wonderful January, and that wherever you live that the weather was not too cold, rainy or snowy, but if it was, I hope that some of the comforting recipes on Diana's Desserts Website for breads, warm beverages and desserts helped keep you and your family warm and cozy during this sometimes very "chilly" winter month. WHAT'S IN THIS MONTH'S DIANA'S DESSERTS NEWSLETTER? As always, included in each edition of Diana's Desserts Newsletter is a Guest Submitted Recipe. 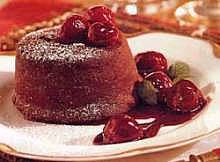 February's Guest Submitted Recipe is for a very romantic Molten Chocolate Cake with Cherries, submitted by Joanne Teo. 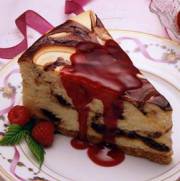 Joanne has also submitted several other great dessert recipes. I also highly recommend trying the Cinnamon Crumble Apple Pie recipe that Joanne has submitted. View it on Diana's Desserts website in the Guest Recipe Book, under the Pies and Tarts category. Apples are such a versatile and lovely fruit for cooking or baking, and also, so very good just eaten "out of hand". They are so tasty used in fresh homemade salads too. Try making a butter lettuce salad with fresh thinly sliced apples, or if you like, use spring greens found at your local market; add a handful of toasted and lightly sugar coated walnuts or pecans, and toss salad together with a crumbly blue cheese or roquefort vinaigrette dressing; very easy to make and so delicious! Serve this simple but very tasty salad along with a nice bowl of hot soup and a warm loaf of sourdough or country style bread for a quick and easy meal. February is the month for lover's, great friends, and just a time to celebrate love in general! Valentines Day is certainly the right time to make some very romantic and special desserts for those we love and care very much about. In this edition of Diana's Desserts Newsletter, I will share with you several special dessert recipes, a very special beverage recipe and a delicious cookie recipe that is great for gift-giving for this day of "Cupid's" Love Arrow, but first a little history on Valentine's Day. Every February 14th, in many parts of the world, candy, flowers, chocolates and other special and romantic gifts are exchanged between loved ones, all in the name of St. Valentine. But who is this mysterious saint and why do we celebrate this holiday? So, who was Saint Valentine and how did he become associated with this ancient rite? Today, the Catholic Church recognizes at least three different saints named Valentine or Valentinus, all of whom were martyred. One legend contends that Valentine was a priest who served during the third century in Rome. When Emperor Claudius II decided that single men made better soldiers than those with wives and families, he outlawed marriage for young men, his crop of potential soldiers. Valentine, realizing the injustice of the decree, defied Claudius and continued to perform marriages for young lovers in secret. When Valentine's actions were discovered, Claudius ordered that he be put to death. Other stories suggest that Valentine may have been killed for attempting to help Christians escape harsh Roman prisons where they were often beaten and tortured. According to one legend, Valentine actually sent the first "valentine" greeting himself. While in prison, it is believed that Valentine fell in love with a young girl, (who may have been his jailor's daughter, and who visited him during his confinement). Before his death, it is alleged that he wrote her a letter, which he signed "From your Valentine," an expression that is still in use today. Although the truth behind the Valentine legends is murky, the stories certainly emphasize his appeal as a sympathetic, heroic, and, most importantly, romantic figure. It's no surprise that by the Middle Ages, Valentine was one of the most popular saints in England and France. What a lovely and very intimate (serves only two) dessert to make for you and your "sweetheart" on Valentine's Day. Try any leftover sauce served over ice cream. Preheat oven to 350�F (180�C). Bake cakes uncovered until edges are set but center is still shiny and tester inserted into center comes out with some wet batter attached, about 22 minutes. Warm sauce over low heat. Cut around cakes to loosen; turn out onto plates. Spoon sauce alongside. Sift confectioners' sugar over; garnish with mint. Prehat oven to 325 degrees F (160 C). Combine all crust ingredients in small bowl. Press onto bottom of ungreased 10-inch springform pan. Bake 10 minutes. Cool. Pour half of cream cheese mixture into prepared crust. Spoon 1/2 cup chocolate fudge topping over cream cheese mixture in crust; swirl with knife. Top with remaining cream cheese mixture. Spoon remaining chocolate fudge topping over cream cheese mixture; swirl with knife. Bake for 65 to 75 minutes or until just set 2 inches from edge of pan. Turn off oven; with oven door open at least 4 inches, let cheesecake stand in oven at least 30 minutes or until center is set. Remove from oven. Loosen sides of cheesecake from pan by running knife around inside of pan. Cool completely. Cover; refrigerate 8 hours or overnight. Meanwhile, press raspberries through strainer; discard seeds. (Strain raspberries again, if seeds still remain.) Combine strained raspberries and cornstarch with wire whisk in 1-quart saucepan. Cook over medium heat, stirring constantly, until mixture comes to a full boil (4 to 8 minutes). Boil, stirring constantly, until slightly thickened (2 minutes). Remove from heat. Cool 5 minutes; stir. Cover; refrigerate until serving time. To serve, spoon raspberry sauce over each slice of cheesecake. Store refrigerated. What a warm and very special drink to wake up to on Valentine's Day. Serve this "decadent" hot cocoa to your sweetie (on a pretty tray), when he or she wakes up in the morning, or just serve on a chilly day for something just a little bit different and special. 1. In a 1 to 2 quart saucepan, combine milk, vanilla bean, and orange peel. Warm over low heat to blend flavors, about 15 minutes, stirring often; do not boil. Discard orange peel; remove vanilla bean and save (dry used vanilla bean, and store for another use(. 2. Add chopped chocolate and caramel sauce to hot milk; stir over low heat until chocolate melts. 3. Pour hot cocoa into mugs (about 8 oz. ), top with equal portions of whipped cream, drizzle with chocolate syrup, and sprinkle with chocolate curls (optional). Serve with spoons. A dark chocolate custard creme brulee capped with a chunk of crisp chocolate praline. The custard can be made through step 5 up to 2 days ahead; cover and chill. A perfect Valentine's Day dessert for chocolate lover's. 1. Cut vanilla bean in half lengthwise; scrape seeds into a 2 to 3-quart pan. Add vanilla pod, cream, and milk. Stir occasionally over medium-high heat until mixture just begins to boil, 14 to 18 minutes. 2. Meanwhile, in a bowl, whisk together egg yolks and sugar. 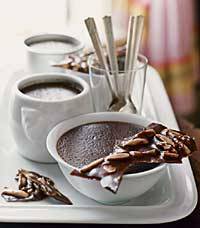 Place chocolate in a small, microwave-safe glass bowl and heat in a microwave oven at half-power (50%) until soft, 1 1/2 to 2 minutes. Stir chocolate until smooth. 3. Lift vanilla pod from cream mixture; rinse and dry for another use or discard. Whisk about 1/2 cup of the hot cream mixture into egg mixture, then whisk egg mixture into remaining cream mixture. Add hot melted chocolate (if it has cooled to room temperature, reheat briefly in microwave oven just until hot to touch; do not overheat). Pour mixture into a blender and whirl until no chocolate flecks remain. Pour through a fine strainer into a 1 to 2-quart glass measure. Stir in Amaretto and Kahlua. 4. Set six to eight souffle cups, ramekins, or teacups (1/2 to 3/4 cup) in a 9 x 13-inch baking pan. Fill cups equally with chocolate mixture. Set pan in a 300 degree F (150 C) regular or convection oven and carefully pour about 1 inch of boiling water into pan around cups. 5. Bake until centers of custards barely jiggle when pan is gently shaken, 30 to 35 minutes. With a slotted spatula, lift cups out. Chill until custards are cold, 1 to 1 1/4 hours (see notes). 6. Garnish each creme brulee with a large chunk of chocolate praline. Serve any remaining praline alongside. 1. Place 1/4 cup slivered almonds in a 9-inch pie pan. Bake in a 300 degree F (150 C) regular or convection oven, shaking pan once, until nuts are golden, 10 to 12 minutes. Coat a 12-inch square of foil lightly with vegetable oil (about 1 teaspoon). 2. In an 8 to 10-inch frying pan over medium-high heat, combine 1/4 cup sugar, 2 tablespoons butter, 1 tablespoon corn syrup, and 1 1/2 teaspoons milk. Stir occasionally until mixture is bubbly and golden, about 5 minutes. Add 1 1/2 teaspoons unsweetened cocoa and stir until smooth, then stir in toasted almonds. Pour mixture onto oiled foil and spread about 1/4 inch thick. Let cool until solid, about 10 minutes. Break praline into 6 to 8 large chunks. These little heart shaped cookies would make a great treat for your kids to bring to school to share with friends (and teachers) for Valentine's Day. Place them in little heart shaped bakets, wrap in clear cellophane paper and tie a pretty red ribbon around it, and give as Valentine's Day gifts. Heart shaped baskets can usually be found at craft stores or variety stores. A little magic with food color and cookie cutters makes these cookies look marbled. Combine sugar and butter in large bowl. Beat at medium speed, scraping bowl often, until creamy. Add egg and orange juice; continue beating until well mixed. Reduce speed to low; add flour and baking powder. Beat until well mixed. Divide dough into fourths. Knead pink food color into one portion. Knead purple food color into second portion. Knead green food color into third portion. Flatten each fourth into disk shape. Wrap in plastic food wrap. Refrigerate until firm (2 hours or overnight). Heat oven to 375 degrees F (190 C). Using one-half of each dough disk (keeping remaining dough refrigerated), alternately place spoonfuls of doughs onto lightly floured surface to create marbled effect. Roll out dough to 1/8-inch thickness. Cut with 3-inch heart-shaped cookie cutter. Place cookies 1 inch apart onto ungreased cookie sheets. Sprinkle with edible glitter, if desired. Bake for 6 to 8 minutes or until edges are lightly browned. Cool completely. Repeat with remaining dough. Chocolate Dipped Strawberries, the ultimate Valentine's Day indulgence. Leave a few of the strawberries plain (not dipped in chocolate), and dip them in whipped cream (or non-dairy whipped topping) for an irresistable and creamy treat! For people who are diabetic or for those of you who are just watching their fat and sugar intake, try these dipped in lite non-dairy whipped topping, or fat-free non-dairy whipped topping. Still very very delicious!! 1. Wash and dry strawberries, leave stems on. Set out on waxed paper. 2. Melt chocolate in double boiler on very low heat, with 1 tablespoon vegetable shortening for gloss. Let chocolate melt completely, then remove from heat. 3. Dip strawberries at least one half up the sides holding them by the stem. 4. Lay the strawberries carefully on waxed paper. If the melted chocolate starts to thicken while you're working, slowly reheat it. 5. Refrigerate the chocolate covered strawberries until ready to serve, at least an hour. Makes 12 chocolate dipped strawberries. *Note: White chocolate can also be used for dipping the strawberries. When melting white chocolate, stir constantly on very low heat, as white chocolate will tend to burn easier than darker chocolate. Wash strawberries and then dry carefully with a paper towel. Lay strawberries on a sheet of waxed paper on a cookie sheet. Put small pieces of chocolate, any flavor, in a microwave safe bowl. Heat very carefully in the microwave, only 30 seconds at a time until just melted. Dip strawberries one at a time into the chocolate, letting some of the red berry show. These will take about an hour to harden, less time if you place the sheet in the refrigerator. Pack dipped strawberries in a singer layer in a plastic container with a lid. Serve within 24 hours, as strawberries tend to start to go bad after a day. 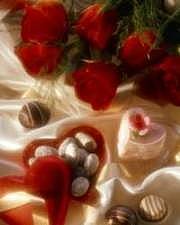 I hope I have given you many nice choices for your Valentine's Day desserts and other goodies. 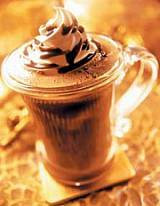 The Decadent Hot Cocoa is a must for serving to the one you love when they awake in the morning. What a nice and very special surprise, don't you think? My pick for the best dessert is the Double Chocolate Cheesecake with Raspberry Sauce, but I also like the idea of sharing the Chocolate Dipped Strawberries with the one I love. Of course, the Double Chocolate Creme Brulee comes in a strong second to the cheesecake. 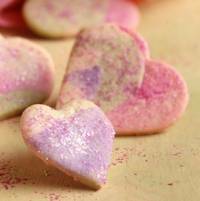 The Pastel Marbled Hearts are lovely for gift-giving, and will put a big smile on the recipients face. They are so pretty, and anyone would be glad to receive them for a Valentine's Day gift. Well, that's it for this very Romantic month of February. On March 17th, the very happy and very "Green" holiday of Saint Patrick's Day is celebrated, not only by the Irish, but by so many people around the world. I will be back next month with some traditional recipes and also some newer treats for this festive and cheerful day. If you'd like to Submit a Recipe to Diana's Desserts Website, please click on the link below. I am always looking forward to your wonderful recipes. Have a wonderful month, and please enjoy Valentine's Day with the one you love.